The Office. Er, Fort. Fortroffice? I needed a writing space. Stephen King told me I did, and I do not disobey Mr King without good reason. The space can be humble (probably should be, as I think I have already suggested), and it really needs only one thing: a door which you are willing to shut. The closed door is your way of telling the world and yourself that you mean business; you have made a serious commitment to write and intend to walk the walk as well as talk the talk. 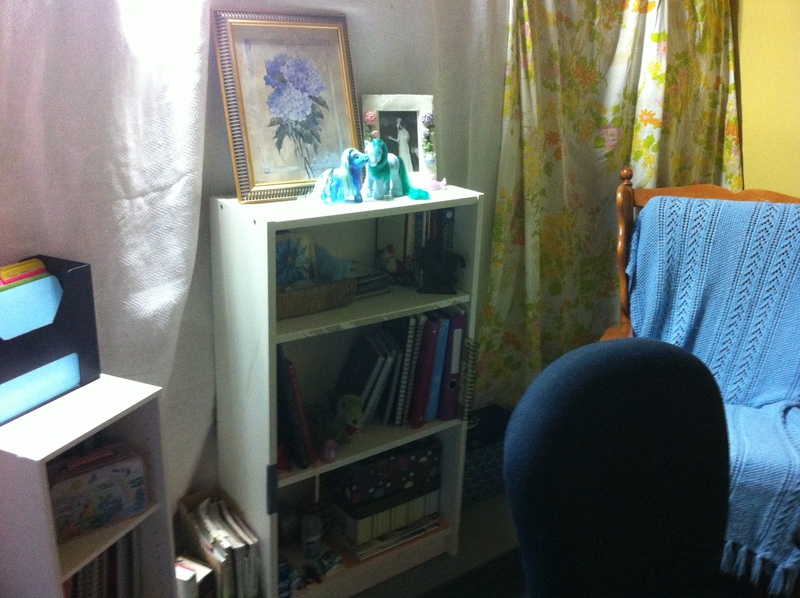 Until a few days ago, my writing space was in the living room. I didn’t have the whole room to myself, just my desk in the corner. That was fine when AJ was working nights and I was alone in a silent house… except that it wasn’t. There was always a mess on the coffee table to be cleaned, dishes in the sink suddenly screaming to be washed as soon as I sat down to write, unmade beds chanting horrible and ominous things in the bedrooms. You see, there was no door I could close. I needed my own writing space, I just didn’t know where to find it. 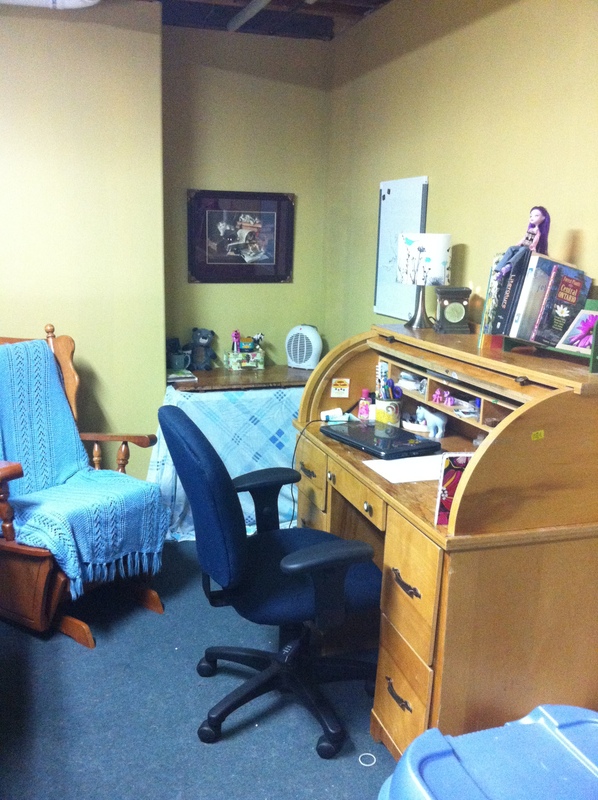 Cassandra Page posted last week about her new writing space– an actual study, if you can believe that. 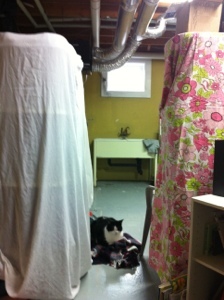 I said there was nowhere for me to have writing space, except for the stinky basement. True, we have a small bedroom that houses the desktop computer and the assorted geekery (read: toys) that AJ and I collect, but it’s not my space, and there’s no room for my desk. I couldn’t take the only enclosed room. 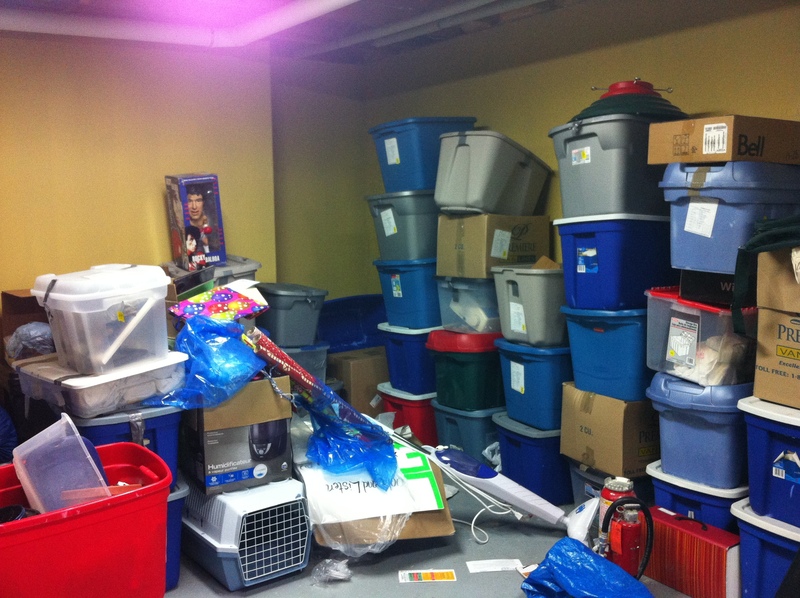 That’s the playroom, and AJ would go insane if that mess moved out into the open. I couldn’t take the TV area beside the stairs. That’s the “boy cave.” So where to put my girl cave? Fine, so it didn’t look like much. Fortunately, I’ve spent a bit of time over the last few years developing my imagination and learning to see possibilities. I was going to make this WORK. Now, obviously I couldn’t just move things and stick my desk in the corner; that would leave me no better off than I was in the living room. No, I needed walls, but my traditional construction skills are somewhat lacking. Good thing I double-majored in box-stacking and blanket fort-building in kindergarten. I knew that would come in handy some day! So I stacked me some boxes, unpacked and threw out some basement-smelling cardboard boxes, put everything back into the bins, and built a wall. I stacked the Christmas decorations in one easily-accessible corner, and covered the inside of my wall with the prettiest vintage bedsheets I had lying around. I stole an icky rug from the cats’ eating area, vacuumed the hair out of it, and laid it down. 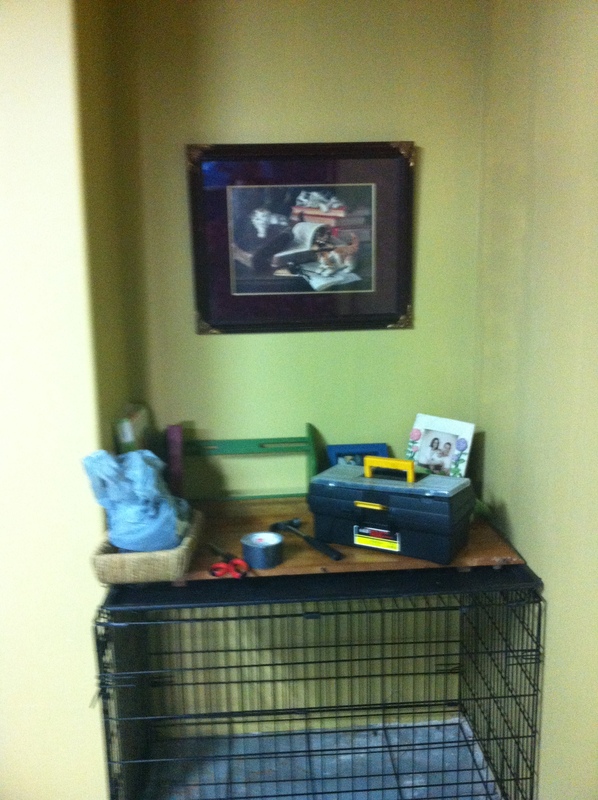 I set up the dog’s old kennel in the corner to make a table to spread my papers out on. Eew. Needs a tablecloth or something. I took a space heater from upstairs, brought down a Scentsy burner, put up a picture, and stole my glider-rocker back from the boy cave, because they don’t appreciate it like I do. I stole borrowed a bookshelf AJ wasn’t using for much in his workout area, and brought another down from my space in the living room. All I needed was… The Desk. Yeah, I capitalized it. 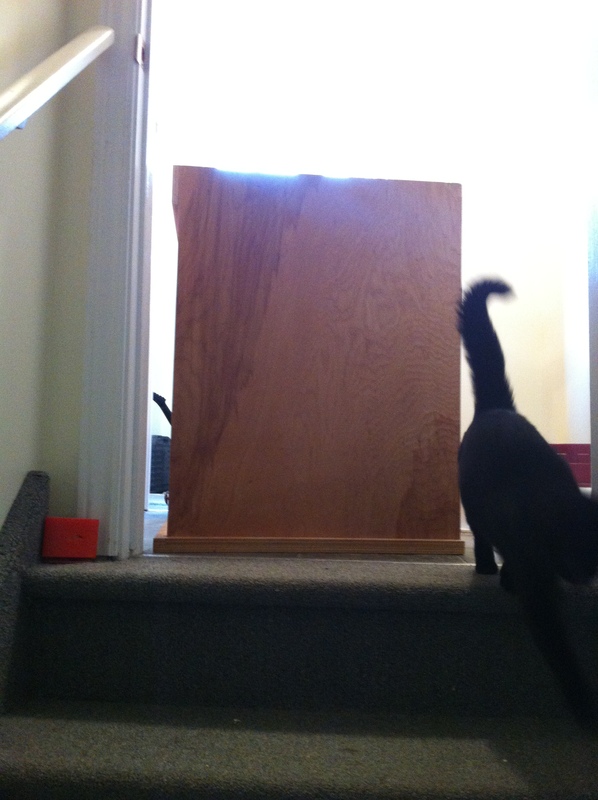 It’s not the biggest desk out there, but it’s 2×4 feet of heavy wood, handmade by AJ’s grandfather, plus a rolltop. Oh, and AJ was away this week, so I had to empty it, flip it, get it down the stairs and into my room all by myself. I still have no door. OK, is anyone else having trouble writing posts? WordPress will only let me type in Text mode (not Visual, no pasting there, either), and everything I type is smooshed together on one side of the screen. IT’S ANNOYING. The good news is that it won’t bother me too much in the near future. It’s almost NaNoWriMo time, and that means you’ll all be seeing less of me. You can breathe a sigh of relief, it’s okay. I’ll wait. So yes, my ROW80 goals are shifting to 2,000 new words a day, minimum, taking Saturdays off and making up the difference elsewhere to hit 50,000+ words by the end of the month. And really, that’s not so bad, is it? I’ll have three hours to myself when kindergarten switches back to mornings, and there’s no reason I shouldn’t get 2,000 words out in three hours. If I need to, I’ll take time whenever AJ is home to watch the kids. The thing is, 2,000 words a day is on the low side for a lot of professional writers. Sure, many people do less and only work when inspired and get a draft finished every five years, but I want to write more than that. I have no discipline, no willpower, and I need to change my habits. This November, I’m not going to look at 2,000 words a day as a lofty goal. I’m going to look at it as business as usual, and go from there. Other goals… Well, I’m beta reading, so checkmark there. I won’t get it finished before NaNo starts, but I’ll make time. Other reading: I read The War of Art, by Steven Pressfield, and it was a really interesting perspective on how and why we struggle with roadblocks/resistance when we’re creating art. He kind of lost me in part three with the mystical angels/muses stuff, but even there I was able to pick up some useful gems of wisdom. It’s a quick read, and worthwhile if you want to create something but can’t seem to get it done. So I guess that’s about it. No, no WIPpet Wednesday for me this week, though to be fair, I kind of gave you a story this morning, even if it was ENTIRELY TRUE. I had a draft I made last week and it’s disappeared, and I can’t do it all over again with WordPress acting up. I’ll see you all tomorrow (maybe) for NaNo’s Eve, and maybe get pictures up of the new office that I built out of boxes and blankets. Maaaaaybe. I want to post links to the other WIPpeteers and ROWers (? ), but I don’t know how to add links in Text, so… head on over to visit KL Schwengel at myrandommuse.wordpress.com (who has posted a particularly excellent excerpt today) and click the WIPpet link there. ROW80 updates will be linked from aroundofwordsin80days.wordpress.com. Go figure. But seriously, is WordPress acting up for anyone else? And what are you up to this week? I don’t usually participate in memes. I do a weekly blog hop here, and I’ll change my Facebook profile picture to a poppy for the first half of November if I can find a picture that’s free to use without copyright infringement, but I don’t do any of the “share if you’re against Wall Street fat-cats wearing live baby penguins as shoes,” or the “post this if you love your children. IF YOU DON’T POST THIS, YOU HATE YOUR CHILDREN” stuff. Likewise, if you ask me to describe you in one word using the letter you were given, I’m all over that and will try to give you a big ol’ warm fuzzy, but I won’t re-post if you give me a letter. It’s a fun game, it’s just not for me, personally. But then a few days ago, my friends started turning into giraffes. They were still posting statuses and stuff, but guys? THEY WERE GIRAFFES. It was right there in their new profile pictures, and I was getting super jealous of their to-die-for eyelashes. When I found out it was all because of a riddle, I knew I had to participate. Either I got to be smug about answering a riddle correctly (and the trick to the question seemed fairly obvious to me), or I got to be a giraffe for a few days. So I answered, confident that I’d nailed it. Another obvious answer came to me a few minutes later, but it was too late. 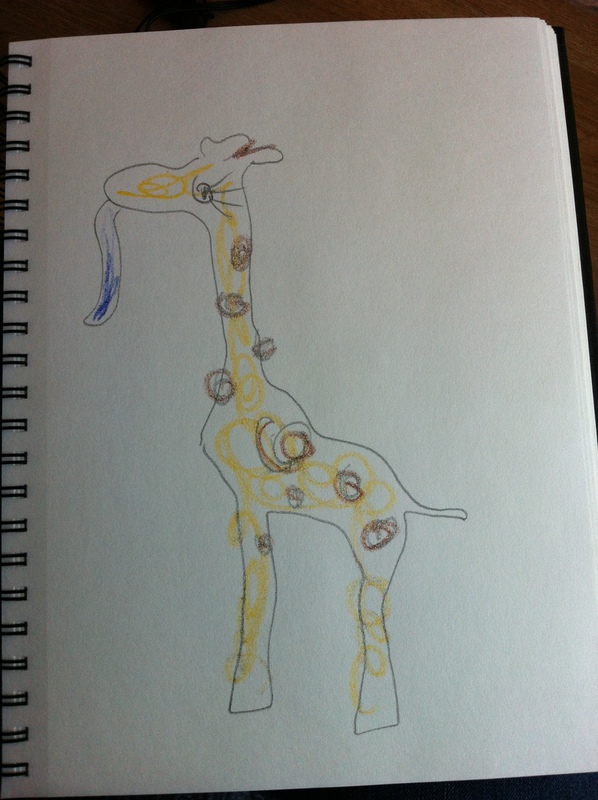 I asked, was told my second answer was correct, but I took my lumps like a lady*, got the necessary supplies together, and transformed myself into a small-ish giraffe. Sadly, I couldn’t work my camera after I transformed and my husband isn’t here to take pictures, so I had to steal my friend’s picture of Sophie the toy giraffe. I should think these things through better in the future. But I do have this self-portrait I drew yesterday. It’s not bad, all things considered. In any case, I had upheld my end of the bargain. It was fun at first. I was ADORABLE, even if I had to bend my elegant neck down to see myself in the bathroom mirror. I didn’t need mascara anymore, and that was a good thing. Have you ever tried to hold that tiny wand in any hands without opposable thumbs? Or fingers, for that matter? But hey, I could pick my nose with my tongue. Sounds gross, but I have a cold, so it was pretty darned convenient. STOP JUDGING ME. The problems started when I broke a light fixture with my adorable head. Even a small-ish giraffe is too darned tall for a house. Worse, I had a lot of trouble cooking for the kids and getting them dressed in the morning. A prehensile tongue is handy (and yes, I’m avoiding the obvious “too bad my husband’s away” jokes here, YOU’RE WELCOME), but beyond a bit of tongue-typing on the computer, I was feeling kind of useless. Oh, and you would not BELIEVE the cravings I was having for acacia leaves. Have you ever tried to get those around here? Good luck, sweetheart. Could I have changed back? Sure. I lost a silly riddle, I wasn’t cursed or something. But I wanted to play fair, and the rules said I had to be a giraffe for three days, so three days it would be. Imagine my relief when I woke this morning to learn (from an online article) that my answer had been RIGHT! Well, so these people claimed. I still think the answer I was given was technically correct, marking the first time I’ve ever come close to arguing that I was wrong, but I wasn’t about to quibble when my physical shape was at stake. I changed back, told my friends that they could do the same if they’d given the same original answer as I had, and went to make the cup of tea I’d been craving but was unable to drink as a giraffe. BUT THEN. I happened to mention that I’d kind of miss the prehensile tongue, and someone sent me a private message (because she’s a decent sort, and didn’t want to embarrass me) saying that I wasn’t actually supposed to turn into a giraffe. All of my friends had just changed their profile pictures to images they’d found on Google. They weren’t giraffes at all. Well, I was flummoxed. I thought I’d been playing by the rules, but it turned out that not only had I answered the riddle correctly (or perhaps “correctly”), I had also gone to a whole lot of unnecessary trouble over my answer. So now I’m feeling quite foolish. I have a light fixture to replace and two holes in the ceiling to fix, and a whole lot of giraffe spit to wash out of the kids’ clothes. All of that, I can deal with. The only question I’m left with is what to do with six bales of acacia leaves when FedEx delivers them this afternoon. *This has nothing to do with Fergie or the Black Eyed Peas. Just for the record. Come here. Closer. Let me show you something. No, not that close. It’s fairly horrible, you don’t want to step in it. I found this while I was organizing my old journals. Why was I doing that? Because I’m a master procrastinator, that’s why. This is something that I wrote while I was in the hospital after I had a baby, way back in 2005. True, I was on drugs (and we’ve all seen what those do to me), but that’s no excuse. I fear you are not fit to eat. Of what you’re made, I cannot guess. What meat is grey? With specks of green? None on earth that I have seen. loaf of meat that cannot be named. When I wrote this, I laughed so hard I almost busted my stitches. Drugs are bad, mmmkay? So’s my poetry. And that’s all I’m going to say about that. Good Wednesday, friends. Are we all healthy? Happy? Warm or cool as is seasonally appropriate in our parts of the world? Good. Have a seat, and let’s see what we have to share today. 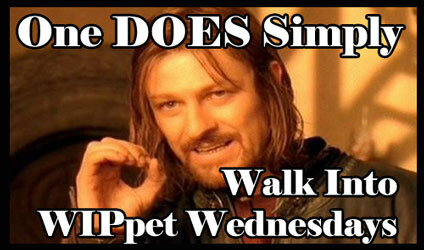 First up: WIPpet Wednesday, and today I’ll be sharing from the first draft (sorry!) of my NaNoWriMo project, which will be further work on the second novel in a planned trilogy. This isn’t your first look at this story; this scene takes place not long after this one, which I posted way back in June. WIPpet math: October 23 = 2+3 = 5 paragraphs from Aren’s perspective. “Perfect,” I whispered. I think she knew I wasn’t talking about the necklace. She left the necklace on all night. Maybe it was all a mistake. Maybe her coming to my room only made it harder for me to leave the next morning. I needed sleep before I started a long journey, but I needed her more. She didn’t have to use words to tell me she felt the same way. To see what the other WIPpeteers are up to, head on over to the ever-convenient linkie-poo and give them all of your clicks and comment love, and say hi to our host K.L. Schwengel on the way by. To join in, choose a sample of your own work in progress that relates to today’s date, whether it be the chapter or page number, or something more creative. Because, you know. I… I missed my Sunday update again. Oops. The chapters on blogging are valuable, too. 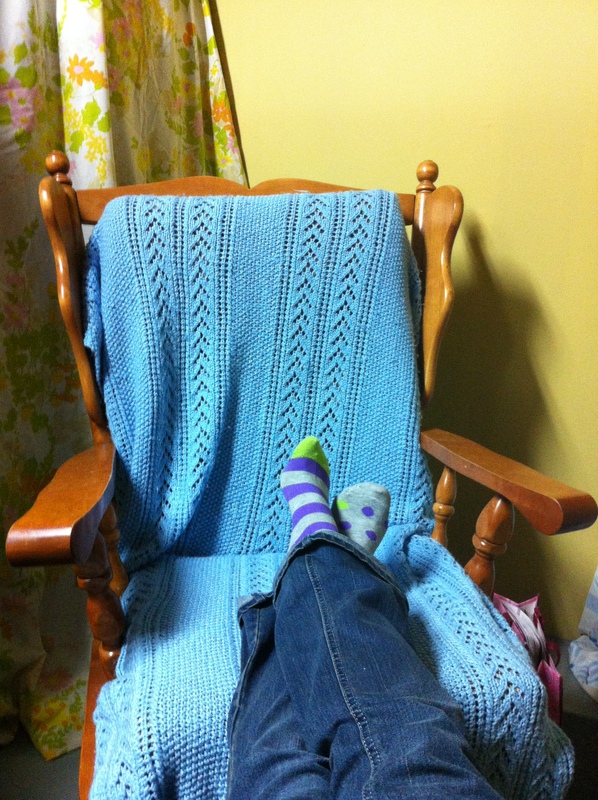 I was happy to learn that it’s okay that my blog’s not all about writing. In fact, Ms Lamb recommends that we share our other passions and reach out to a wide variety of readers, since they’re the people who might just (perhaps, maybe, some day) decide to check out our books. So if you’ve been wishing I’d quit posting about ponies, Newfoundland, and my failed attempts at gardening… well, I’m sorry. So yes, highly recommended read for anyone with a book coming out, however you’re publishing. It’s about so much more than just social media, but I’d say it’s worth the purchase price just for the section on “Twitequette,” which should be required reading for everyone on Twitter. As for writing… well, I made some notes while I was waiting (FOREVER) at the doctor’s office yesterday, so… yay? Maybe this afternoon, when I’ll finally have the house to myself for a few hours… I hope. That’s right. I encountered something called a Thorny Devil. It was large, and leggy. I interrupted it when it was trying to boff its unwilling mate, and I lived to tell the tale. 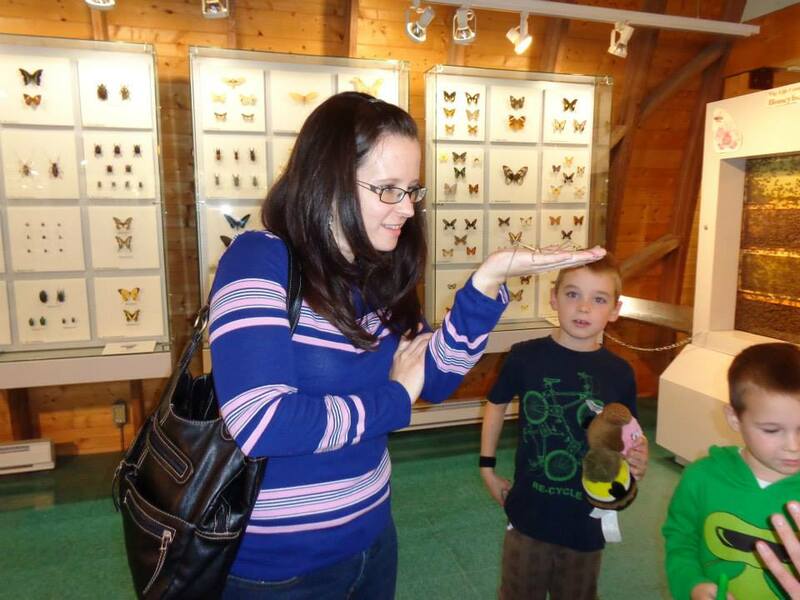 All of which is to say that I went to the Newfoundland Insectarium with my mother and kids, and it was amazing. Care to join us for a tour? Good. Confession: I wasn’t planning a blog post while we were there, I was just having fun. So if the photos are somewhat lacking, you know why. If you’d like to see more and better photos with less of me in them, click here for the official photo gallery. 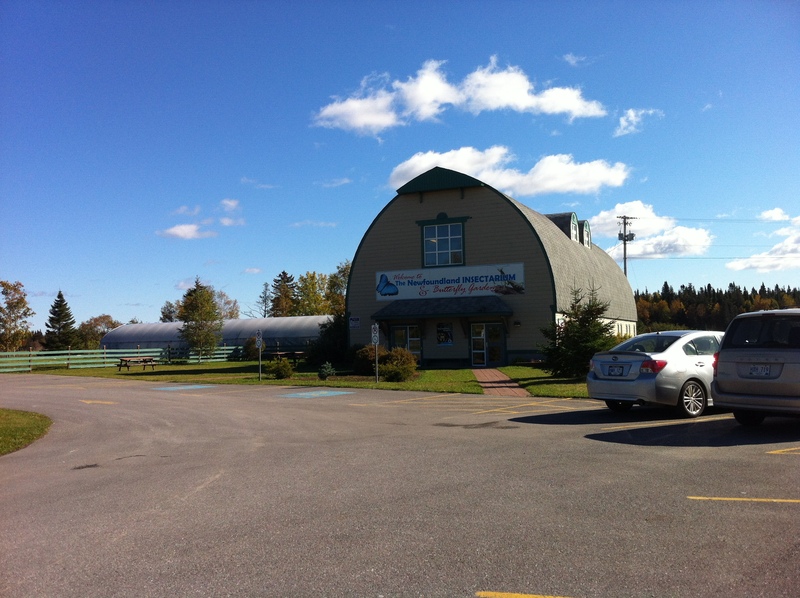 The insectarium is in Deer Lake, NL, otherwise known as Too Dang Far From My House. This was only my second chance to visit, but I’m hoping for another trip next summer. Because did I mention AMAZING? 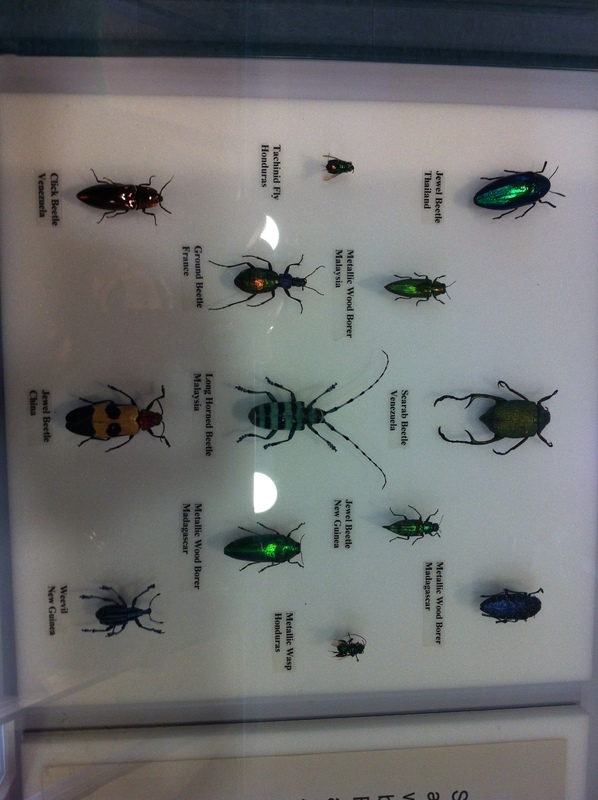 You walk in, and there are a couple of displays in glass cubes– one of beautiful beetles (beetiful beautles?) 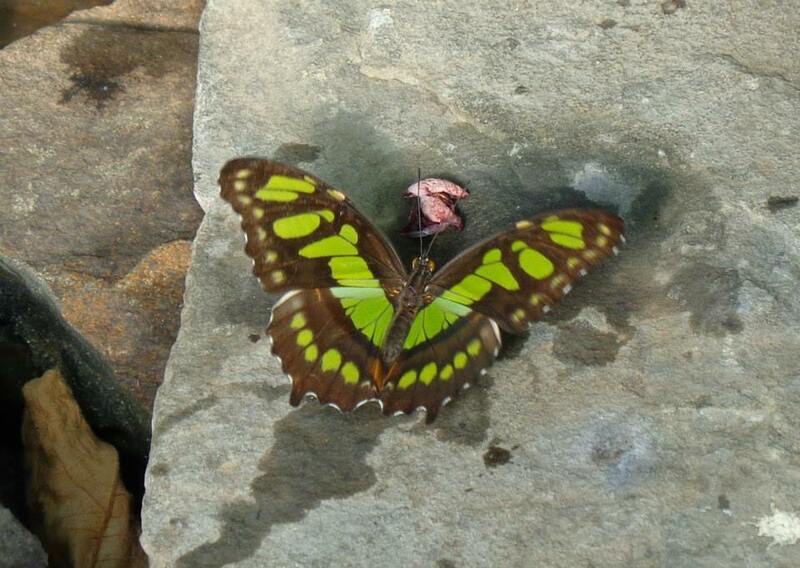 and one of butterflies. Then it’s OMGHOLYCRAPGIFTSHOP! But that’s not why we’re here. No, get your face off of the glass, you’re leaving nose-prints. You can stop on the way out. Some of you (heck, most of you) might not like many bugs, but you probably don’t mind butterflies so much, so here’s hoping they’re what shows up in your WordPress Reader previews. 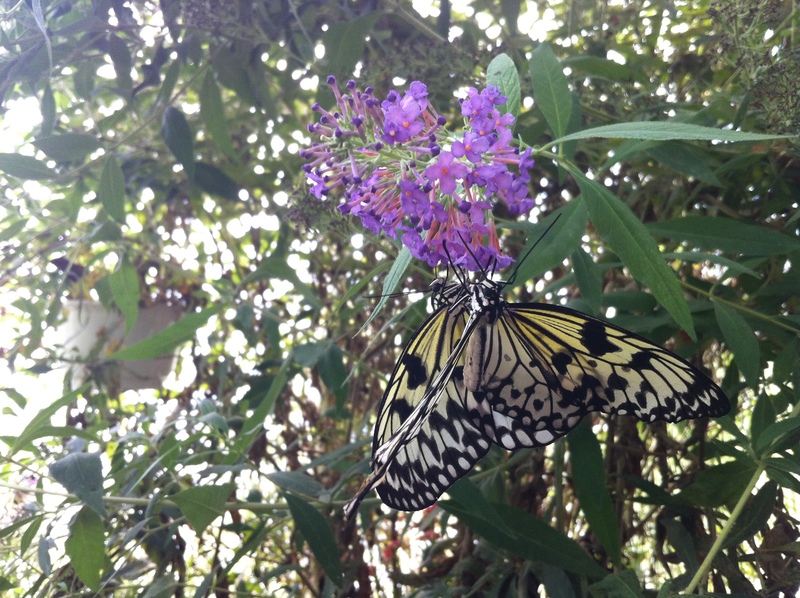 The butterfly house is our first stop. It’s warm, it’s so humid that your camera lens fogs up, and it’s downright magical. This little guy was totally flirting with me. Photo courtesy of Wendy Lowden, because this little beauty wouldn’t sit still for me. 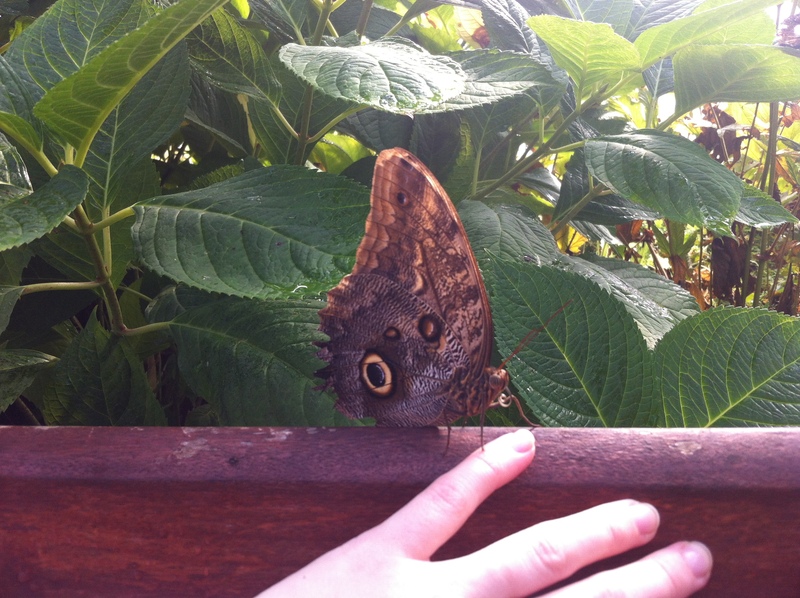 There were TONS of butterflies, because they’d got a late (accidental) shipment. Yay! So then, up the stairs. Alllll the way up to the second level, where we find the main display level. 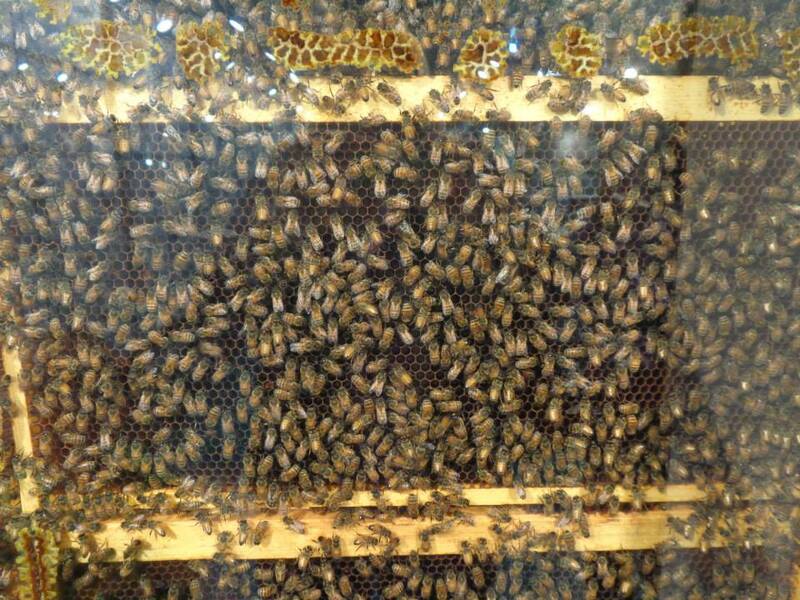 Most of the insects up there are dead and mounted, but there’s a fascinating glassed-in bee colony, where you can watch the little buzzers doing their dances. Oh, and some live insects, too. We were fortunate to be the only people visiting, so we had a chance to speak to a few of the people who work there, and one of them offered to let us hold the stick bugs. There, you can see some of the mounted displays behind me. That little guy was so light, I could hardly feel him on my hand, and he just kind of laid there like… well, like a stick. Good job, little bug! The next ones he (the guy, not the stick bug) took out were called “Thorny Devils,” which apparently are also known as Marijuana bugs for the scent they produce when they’re agitated. 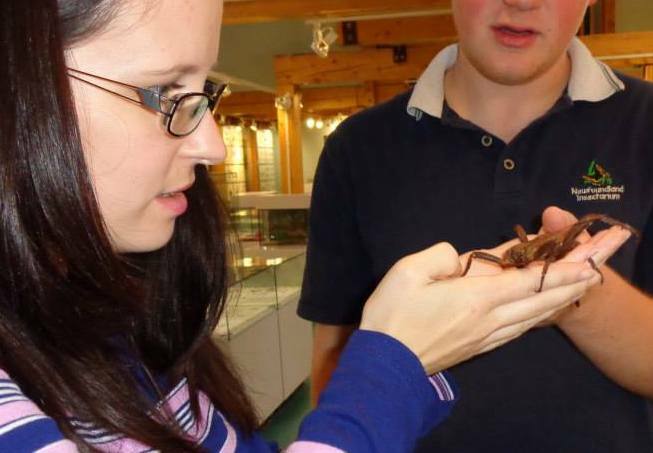 They’re a lot scarier-looking than the skinny little stick insects, but the guy got one out, so I asked if I could hold it. BIG bug. Heavy bug. Kinda creepy, very interesting. 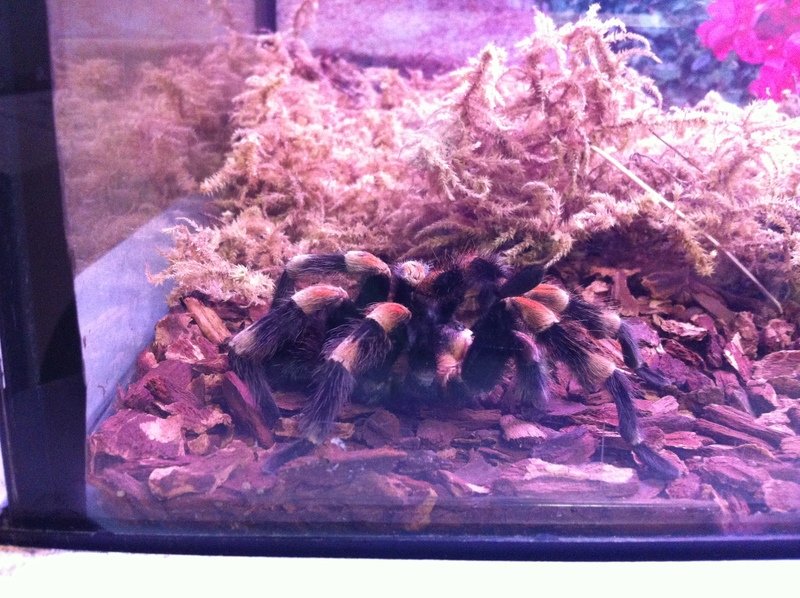 I’m not going to lie and say I was completely comfortable with this girl’s scratchy little claws digging into my skin and her boyfriend waving his feelers at me (yes, I held both) but I’m glad I did it. That’s right, I can hold one of those, but a little house centipede makes me freeze and squeal like an injured puppy. THAT, apparently, is where I draw the line. Side note: this one (the big female) was missing a leg, which led to a discussion of how insect matings aren’t generally gentle or consensual. I said, “Like ducks?” This was the first time I ever surprised and impressed someone with that bit of knowledge (he was just going to say, “like ducks.”) I don’t expect this to ever happen again, but hey, it was special. IT WAS A MOMENT, YOU GUYS. This level also houses the leaf-cutter ant colony, which I find fascinating. See those green dots on the log in the middle? Those are ants carrying cut-up leaves back to their colony, where they feed it to the fungus they then harvest and eat. Guys, THE ANTS ARE FARMERS. 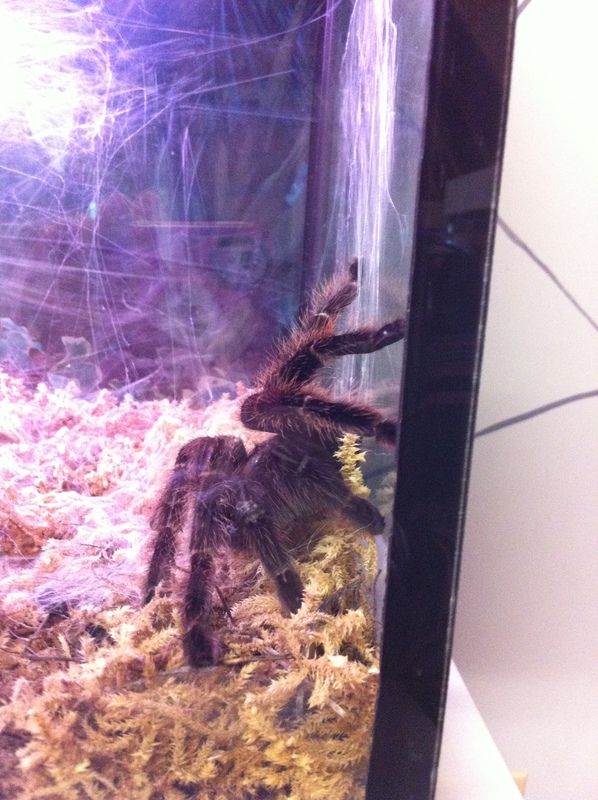 You know, I kind of don’t want to post pictures of the tarantulas, since we’re having so much fun here, and I know some of you don’t like spiders. Hmm… I’ll tell you what: no hard feelings if you want to leave now and go back down to that lovely gift shop to wait for the rest of us. I’m heading upstairs to see the Very Large and Hairy Arachnids, which are kept on the third floor for the benefit of those who don’t want to see them. For those of you leaving us now, thanks for coming along! Stop by the comments (um… just scroll down REALLYREALLYFAST) and tell me about the scariest thing you did this week, whether it actually frightened you, or just stretched you outside of your comfort zone. Heck, even if it’s just looking at the pictures down there, tell me about it! 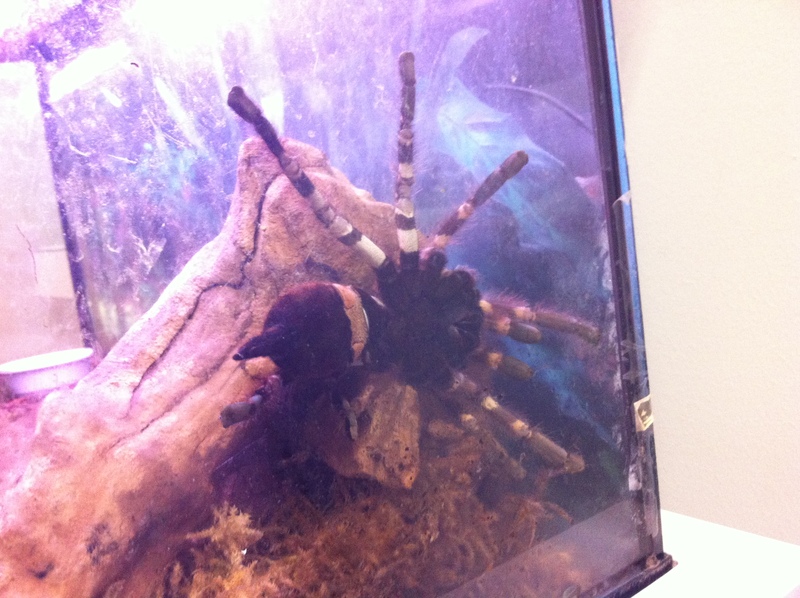 They have eight live tarantulas in all… if you’re into that. Thanks for coming along! Hope you had fun. If you’re ever in Western Newfoundland, I highly recommend a live visit. For more information, including seasonal closures and hours, click here!